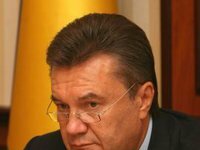 Ukrainian President Viktor Yanukovych has said it is necessary to improve legislation on religious matters to allow believers to pray where they wish. "People should have the right to pray where they wish," the presidential press service quoted him as saying. According to the president, the legislation should provide such an opportunity for all believers, regardless of their denomination. "We need to relax the legislation requirements and ensure believers have an opportunity to pray where they wish," he said. Yanukovych said that he treated all churches with equal respect. The presidential press service noted that the current legislation states the need for obtaining official permission for worship service, if it is held not in specially designated places. Early this month, the Culture Ministry told head of the Ukrainian Greek Catholic Church, Major Archbishop Sviatoslav (Shevchuk) that priests need official permission to hold services in places such as Independence Square in Kyiv. The ministry said that a failure to comply with these requirements might be the grounds for a court ruling to suspend the activities of relevant religious organizations. The ministry's warning was a response to services held by Greek Catholic clergy on Independence Square during current pro-European Union demonstrations. In response, Major Archbishop Sviatoslav said it was for the first time since Ukraine became independent that a threat was made "to put an end to the activities of religious organizations of the Ukrainian Greek Catholic Church." The Greek Catholic Church is not involved in politics but "cannot stand aloof when believers ask it for spiritual assistance," Sviatoslav said. "It is the duty of a priest to be with his fellow believers, a duty that is part of the mission of the Church. Our Church has always been loyal to this mission, a mission that Christ the Savior himself has entrusted to it, and will remain so in the future in spite of any threats," he said.